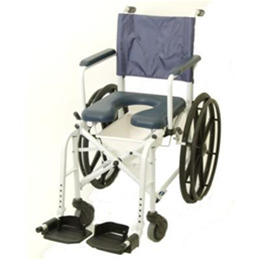 The Invacare Mariner Rehab Shower Commode Chair offers a lightweight aluminum frame and stainless steel hardware making it ideal for shower use. Flip-back padded arms, swing-away front riggings and a four-position padded seat aid in providing user comfort. Available with a 16" or 18" seat.